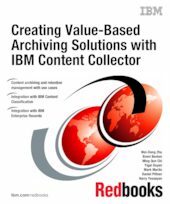 This IBM® Redbooks® publication describes how the IBM Content Collector family of products can help companies to create value-based archiving solutions. IBM Content Collector provides enterprise-wide content archiving and retention management capabilities. It also provides IT administrators with a high level of control over the archiving environment. From a common interface, organizations can implement policies that define what gets archived from which source system, make decisions about how content gets archived based on the content or metadata of the information, and determine the retention and governance rules associated with that type of content. Content Collector enables IT staff to implement granular archiving policies to collect and archive specific pieces of information. This book covers the basic concepts of the IBM Content Collector product family. It presents an overview explaining how it provides value-based archiving and a defensible disposal capability in the archiving solutions. With the integration of IBM Content Classification and IBM Enterprise Records, the book also explains and showcases how these products can be used to add more flexibility, power, and capabilities to archiving solutions. The book is intended for IT architects and solution designers who need to understand and use IBM Content Collector for archiving solution implementations. Use cases are included to provide specific, step-by-step details about implementing common solutions that fulfill some of the general business requirements.